The Solaris Editors' Blog: One week warning: James Lovegrove will be talking about gods and 'Godpunk' next Thursday! 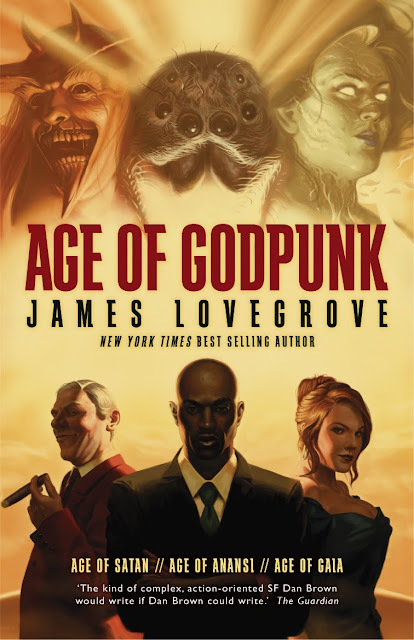 One week warning: James Lovegrove will be talking about gods and 'Godpunk' next Thursday! You have just ONE WEEK left to book your place at the launch of Age of Godpunk in London! The sixth instalment in James Lovegrove's New York Times best selling Pantheon series will launch at Blackwells Charing Cross Road on Thursday September 5th at 6pm. Jared Shurin, of the cult genre website Pornokitsch and co-founder of the book award The Kitschies, holds an evening in conversation with the author, talking about the new subgenre, who called it 'Godpunk' first, why humanity is compelled to rebel against the Divine, and just which is the best Pantheon of them all.